Borrowers can get Personal loans at attractive interest rates as we go beyond Credit Score and assess their profile based on 60+ parameters using our proprietary psychometric test and credit score model. On our platform, lenders can directly lend money to real people and earn high returns with principal protection in easy, secure and seamless manner, earlier only available through banks. What is marketplace (Peer to Peer ) Lending ? Generally, marketplace lending refers to the practice of lending money to borrowers without going through a traditional financial intermediary such as a bank. 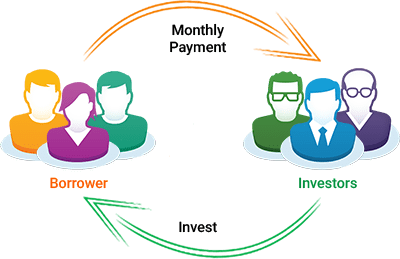 Peer to Peer lending, also known as P2P Lending, is a financial innovation which connects verified borrowers seeking unsecured loans with lenders looking to earn higher returns on their investments. Peer to Peer Lending is already a hugely successful model for alternate financing across the globe. In Jamaica, P2P Lending is gaining traction at very slow pace, however it is a very attractive investment option for lenders. We provide lenders an opportunity to Lend as per their preference and earn returns up to 40%. lenders can extend credit to lower-risk classes as well as high-quality prime borrowers. Our role in all of this is to run the Peer-to-Peer Marketplace. We act as an intermediary so that the Borrowers and Lenders can keep their anonymity. And finally, we collect and distribute payments back to the Lenders on behalf of the Borrowers. We are heavily data-driven and employ semi-automated risk assessment methods as well as nontraditional data points to screen and verify our borrowers. This allows for not only verification but also assessing credit risk before listing on our platform. Idle funds can instead be Lended as growth capital for Jamaica, real growth, rather than nominal value appreciation, can be created for Jamaica by helping people to solve their everyday financial problems and providing small businesses with the capital to grow. This can potentially drive the national economy forward and create growth and employment in the long run. Our lenders can provide you with funding where banks are unwilling or unable to do so. Based on our recent surveys over 50% of borrowers who use our platform were unable to get a loan from anywhere else. Finally, loan applications through our platform are often easier to obtain than bank credit. Fewer branch visits are required, and loan applications can be completed from borrowers preferred location. Typically, less paperwork is required as we are able to harness already available data. Applications can typically be completed within a few hours or less, and do not involve a visit to a physical branch. Funds are then usually made available within less than one week, compared to two to three weeks for banks, or even more. Access our free financial education courses, resources and articles that will help you make better financial decisions, teach you how to increase your savings, help improve/ repair your credit score and become more resilient to economic shocks.